One of the cool things about biking around town on bikes is that you can basically avoid any and all congestion or major choke points that motorists or transit is forced to succumb to. There are a few choke points that we’ve become very aware of in the cycling community. The reason is that Trimet has connected some of the latest and greatest of Portland’s bicycling infrastructure to some of the latest and greatest transit infrastructure in the city. Right where that major connection point is there’s the major Class 1 Union Pacific railroad crossing in southeast Portland. Here’s a map of where the crossings are that stymie these two major connection points of bicycle and transit infrastructure. On the map you can see the railroad lines running across the southeast region, with two at grade crossings near SE 8th and then at SE Milwaukie/12th Ave. At the SE Milwaukee/12th Crossing the major bicycle mixed use path for cycling and walking is parallel to the tracks on the southwest side of the tracks. When a train stops along these tracks the area is effectively divided between the two sides. On just the northeastern side of the tracks happens to also be the Clinton St bicycle greenway. This is one of the busiest greenways in the city. Thus, having the railroad there is seriously inconvenient during rush hour. The latest billion plus dollar project did nothing to mitigate this problem and regularly causes massive back ups that spread all the way to Powell, 12th and 11th St, up Division, and push drivers onto Clinton and onto other streets that they are NOT SUPPOSED TO BE USING as an arterial road. That’s all a huge problem for the increasing number of motorists in the city. However, for us cyclists there are actually some super easy ways around this back up. Of course, it would have been ideal that the route would have had a way for cyclists to get over the tracks here, to complete the actual major connection between these two highly used routes – but we don’t have that. So here’s the next best alternate routes if you see a train blocking the route. NOTE: Do NOT climb over the train. If it snaps back IT WILL KILL YOU. I’m not even slightly joking about this, and most people are obliviously unaware that this happens. So they think, oh – it won’t just take off and I can climb over it. This is NOT TRUE. 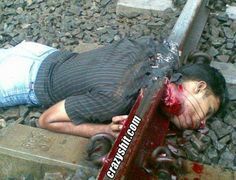 Hundreds of poeple are killed a year by doing this dumb manuever and trying to climb through the train. Also note, if you climb over the train and the railroad police catch you, they are NOT the kind and friendly Portland police. They’re used to dealing with hobos and generally aren’t held to the same friendly standards of normal police (and the normal police aren’t always friendly, especially if you don’t fit into cookie cutter Wally Cleaver appearances). Anyway, you’ve been warned, just don’t jump over the train – I don’t want to read about splattered remains or dismemberments (don’t look unless you want a brutally horrid remind of how you die when you’re sliced up or smashed by a train). So anyway, on to the great alternate routes us cyclists can easily take (and pedestrians but it’s a good 15 minutes longer). Click for full size image of the Clinton Powell Alternate Route. At point (A) is where the Clinton Street Greenway and the cycling mixed use path infrastructure connects. From the northeast side of the tracks, the second you realize a train is on the tracks, cut back to 19th (C) and head due south to Powell. There you’ll see a mixed use path sidewalk that head down and under the railroad overpass. This path (B) is seperated from Powell and is a very safe and easy route. On the map you can see the solid green line, where you can then loop back around and onto the new infrastructure and head south, north, or even further down Powell westward if you’d like. If you’re coming from the southwestern side fo the tracks you’ll be riding parallel to the tracks anyway, which gives you an immediate idea of the train and where it sits. If that path is blocked continue toward Powell and take the same underpass (B) parallel to Powell and then turn left on 19th (C) and head back to Clinton. Of course, you can head whichever way from there, but getting back to Powell is super easy. Either way, total travel time is about 4-5 minutes extra. If you’re a fast rider then you’ll likly lose no more than 2-3 inutes. It’s easy, seperated from automobiles most of the way, and a very calm route to ride. The MLK/Grand McLoughlin Alternate Route. Click for full size image. If you’re coming down Lincoln or anywhere out of the immediate southeast that is northeast of the railroad and north of Division, it is arguably easier to head over to Lincoln and cut onto the sidewalk across the SE Grand Ave/McLoughlin Street Viaduct Bridge overpass (or whatever it’s called) and then down the pedestrian sidewalk paths onto and back to the Caruthers Street bicycle infrastruture or just head down Water Ave directly onto the bridge cycle-tracks. So even though there appears to be a complete gap for getting over or around the railroad infrastructure here, there are some pretty easy and acceptable routes to mitigate the problem. Cheers, and happy riding! ← Previous Post MAX Line Skateboarding Adventures!